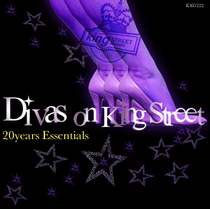 Contemporary and legendary female vocalists alike have graced this commemorative 20 Years Essentials edition of Divas on King Street and just the very mention of some of their names brings glory and glamour into the spotlight. Legendary female house music singers like Barbara Tucker, Michelle Weeks, Kimara Lovelace, Linda Clifford, Ultra Nate, Dawn Tallman, Stephanie Cooke, and their contemporary counterparts Monique Bingham, Tiombe Lockhart, Gaelle Adisson, Heather Johnson, and others have at one point or another raised hands and spirits on some of the world's best dance floors with their songs. Coupled with their respective world-renowned producers Dennis Ferrer, Kerri Chandler, Kenny Dope, Chris Brann, Ralphi Rosario, Blaze, Mood II Swing, Sean McCabe and more, they provide a variety of rhythms, loops and melodies that span two decades of productions. Revamped back catalog songs like ‘When Can Our Love Begin’ (Richard Earnshaw Remix), ‘Party Girl’ (Abel Ramos Havre de Grace With Love Mix), ‘I Hear The Music’ (Aki Bergen Dub-O-Matic Mix), ‘Closer’ (Fred Everything & Oliver Desmet Remix) to ‘Be Yourself’ (Agora Rhythm Mysterious Vox) and ‘Dance Until We Die’ (Kenny Dope Remix) make this 20-piece set an indispensable collection for house music lovers around the world. It’s out June 3, check out the classic 'Church Lady' from the album, below.